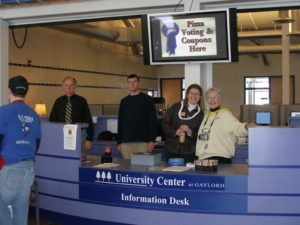 The University Center (UC) Gaylord, a barrier-free facility, is centrally located in the northern lower third of Michigan. Our location provides easy access from both I-75 and M-32 in all seasons and is located (see Directions) in the Educational Complex just 1 mile north of downtown Gaylord. UC Gaylord is a partnership of colleges and universities: two community colleges and six four-year universities both public and private. The schools partner together to offer certifications, Associate, Bachelor, and Master. The 2+2 model creates the opportunity for degree seeking students to obtain their first two years of college here and then transfer to a college of their choice, or, in selected areas of concentration, complete their four-year degree at one of the University Center Gaylord partners. Classes are offered during the day, evening and weekends. Students can start here directly after high school, return after being away and continue a degree program, or start school later as an adult learner. College advisors are available by appointment to discuss academic goals and how to apply for financial aid. Individuals can also complete a GED by arrangements with the UC Gaylord staff, and then learn how to begin a college degree. University Center Gaylord offers a Media Center for free online access for students and faculty and state-of-the-art meeting rooms for businesses and organizations. Local restaurants offer catering and delivery services. The Otsego County bus system is available for local travel to and from the University Center. Facility hours are 8:00 am to 9:00 pm Monday through Friday and from 9:00 am until 4:00 pm on Saturday. The University Center closed on Sunday and holidays. The University Center offers a Community Education program based on the interest received and the instructor availability. Our most popular classes are computer and foreign language. We welcome ideas from potential instructors. If the subject fits within our mission and a sufficient number of students are interested, we will offer most any topic.